GEORGE C. MAYNARD. Archive. 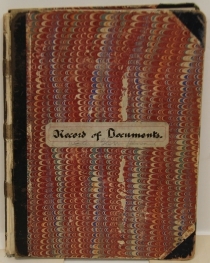 Journals, notebooks, notes, and related papers regarding the spread of telephone communications in the late 19th century. Nineteen items. George C. Maynard (1839-1918) started as a Civil War telegraph operator, worked for Western Union, and then the U.S. Army Signal Corps developing a system to report weather by telegraph. He moved to Washington, D.C. and worked installing electricity and private alarms until Alexander Graham Bell recruited him to help promote the telephone in Washington. Maynard successfully brought the telephone to D.C. but not without competition from Thomas Edison. Maynard then helped bring electric power to Washington by establishing a National Electric Company. Later, he was curator at the National Museum (now the Arts and Industries Building at the Smithsonian Institution), where he documented the growth of the telecommunications and electricity industry. 1. GEORGE C. MAYNARD. 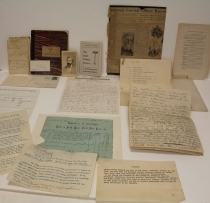 Record of Documents. West Virginia and Washington, D.C., October 25, 1883-June 30, 1887. 44 pp. 8 x 10½ in. The journal contains a record of documents pertaining to the founding of the National Electric Company, including the Certificate of Incorporation (p. 7-8), company by-laws (p. 13-17), the form of a stock certificate (p.18-19). The documents span the first thirty six pages of the book, as well as pages 100-107. Spine has begun to separate. 2. GEORGE C. MAYNARD. Notebook. Various cities in the U.S.1879-1882. 23 pp. 3½ x 6 in. 3. GEORGE C. MAYNARD. Journal. Washington D.C. April 13, 1874-September 30-1875. 40 pp. 6 x 7¼ in. This book includes information on the location and composition of lightning rods around Washington D.C. Some of these locations are the War Department, Department of the Navy, and the new British legation which was still under construction. Textblock is detached from the cover with some minimal page toning. 4. GEORGE C. MAYNARD. Business card. Washington D.C. 1881. 1pp. 3½ x 1¾ in. The card lists Maynard as both an electrical engineer and an editor for the Electrical Review based in New York City. 5. GEORGE C. MAYNARD. Invitation Card. New York. 1887. 1pp. 4¼ x 3½ in. An invitation from the American Institute of Electrical Engineers inviting Maynard to hear a speaker. 6. GEORGE C. MAYNARD. Autograph biography of his family. 7pp. 8 x 10¼ in. Maynard writes the history of his family, beginning with a short biography of his mother and finishing with the family’s move to Onondaga. The first page is missing. 7. GEORGE C. MAYNARD. Typed document. 1pp. 8 x 5 in. This typed “Foreword” gives a short biography of Maynard’s life. 8. GEORGE C. MAYNARD. Detached page from book. 1pp. 6 x 9 in. A detached page from a book gives the Maynard’s ancestry. 9. GEORGE C. MAYNARD. Receipt. Montrose, PA. September 20, 1889. 1 p. 10½ x 8 in. A Maynard receipt shows goods bought from S.B. Rogers. 10. GEORGE C. MAYNARD. Typed memorandum, signed. November 30, 1912. 1 p. 8 x 10½ in. A memo regarding personal accounts of Maynard with information about the settling of his estate. Also signed by Maynard. 11. GEORGE C. MAYNARD. Newspaper Article. 2 pp. 8¾ x 10½ in. An article including an excerpt from Maynard’s journal giving a detailed account of the early spread of the telephone. Also includes a picture of Maynard. 12. GEORGE C. MAYNARD. ALS. Washington D.C. June 29, 1882. 1p. 8 x 10 in. A letter from George C. Maynard to his Aunt Eliza about the weather and the antics of his son Colton. The letter is on his personal letterhead. 13. GEORGE C. MAYNARD. CDV. Washington D.C. 1p. 2½ x 4¼ in. The CDV features a backmark from M.P. Rice and A.I. Rice. Minor damage near the upper edge. 14. GEORGE C. MAYNARD. Work Estimates. January 1883- May 1883. 12pp. 7¾ x 10 in. Seven estimates listing different types of improvements such as running wires and installing electric door bells and burglar alarms. 15. GEORGE C. MAYNARD. Typed Extract of a letter from Jefferson Davis to his wife. Charlotte, NC. April 23, 1865. 1p. 8 x 5½ in. 16. GEORGE C. MAYNARD. List of Artifacts for the Smithsonian. circa 1916. 3pp. 8 x 10½ in. A list of items donated to the Smithsonian with notations around them in pencil. 17. GEORGE C. MAYNARD. Engle Primary Battery Pamphlet. Washington D.C. circa 1913. 4 pp. 3½ x 5½ in. The pamphlet describes the Engle battery and options regarding the incorporation of state and independent companies. 18. GEORGE C. MAYNARD. Unused Proposal for Electric Lamps. Kansas City, MO. 1880’s. 2pp. 8 x 10¼ in. Proposal to the Kawsmouth Electric Light Company requesting the installation of “lamps and lights”. Also includes the rates for each time circuit as well as the cost of the lamps themselves. 19. GEORGE C. MAYNARD. Autograph documents regarding his dream house. Washington D.C. 1886. 22 pp. 8 x 10 in. The documents contain handwritten details on different areas of Maynard’s new dream house in Washington, D.C. The plans go into specifics of multiple rooms, as well as a general plan of the house itself.